It used to be that in virtually every tributary of the Chesapeake Bay tidewater, a clutch of industrious men in a fleet of small skiffs worked the waters for hard crabs, clams, oysters and finfish, and scoured the shallow grass flats for soft crabs — changing out minimal gear for the catch in-season and taking the weather as it came. 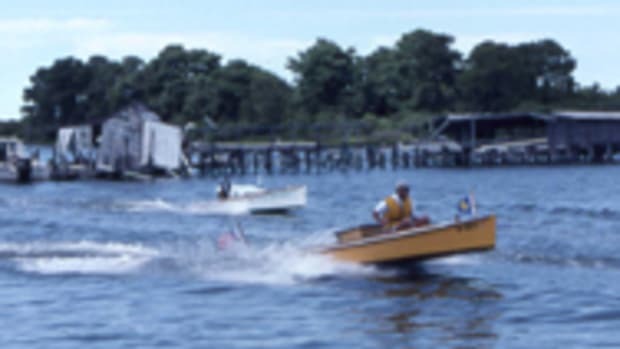 The boats were inexpensive and strong; the watermen were weathered and judicious in how they used the skiffs. 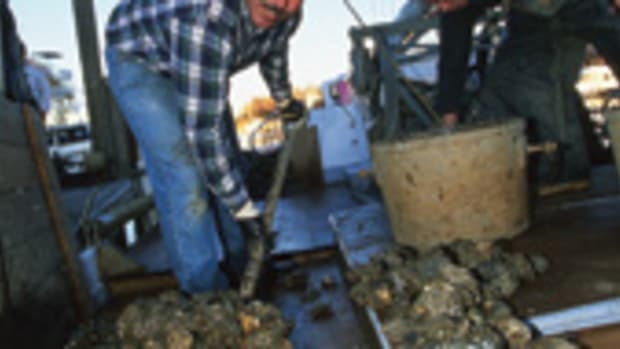 Together they built the foundation of working the water in the Chesapeake. 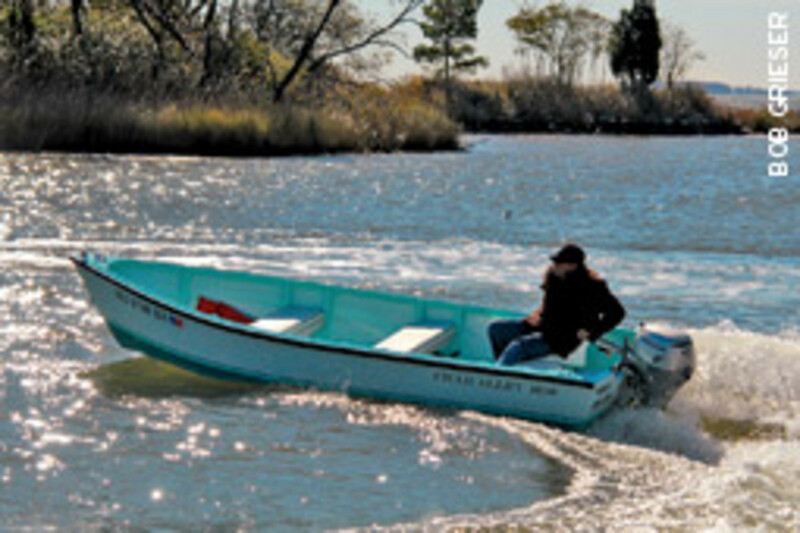 Tom Jones of Crab Alley Custom Boats packages that Chesapeake tradition with a modern twist with two remarkably simplistic skiffs: the Crab Alley 1600 and 1800. Jones also recently expanded his lineup to include the CA 1900 RW (Rough Water). Each has the look of a traditional, flat-bottomed wooden skiff, with raised bow and hard chine hull, but both were made from Synboard brand PVC material using glue-and-screw construction. Not a stick of wood was used in the assembly of the skiffs, Jones says. 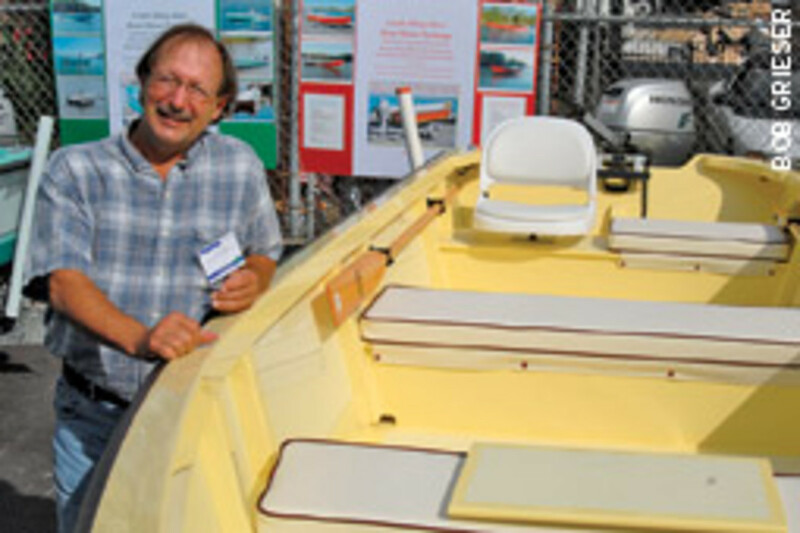 “I think I’m the only person in the world building a ‘wooden boat’ out of PVC,” he says. The result is a lightweight craft that Jones says exceeds U.S. Coast Guard flotation requirements and will not sink, burn or rot. 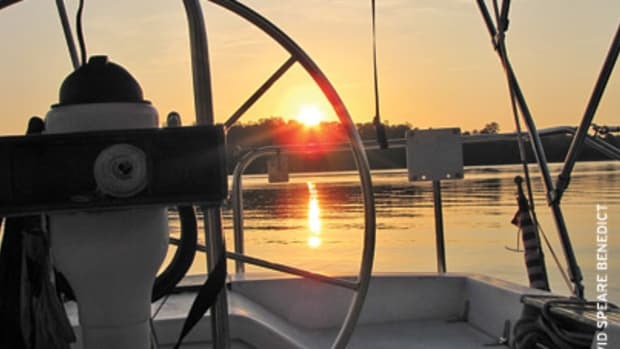 Each boat is built expressly for its buyer with custom hull colors, matching seat cushions, and a properly sized and fuel-efficient outboard motor. 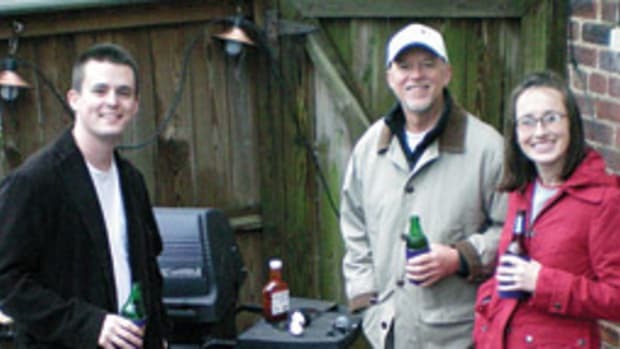 For Jones, building custom skiffs is a reminder of his youth. Even his shop is a reminder of the days of the watermen. Jones says the 18-footer — which he displayed, along with the 16-footer at October’s United States Powerboat Show in Annapolis — took about 600 hours to complete. “[It] surveyed at a replacement cost of $46,000,” he says. Cutting and shaping PVC stock is accomplished using mostly simple hand tools. The pieces are then glued together with an adhesive — Bond&Fill, specially formulated for use with PVC — and screwed into place while the adhesive is wet to ensure a strong, tight bond, he says. 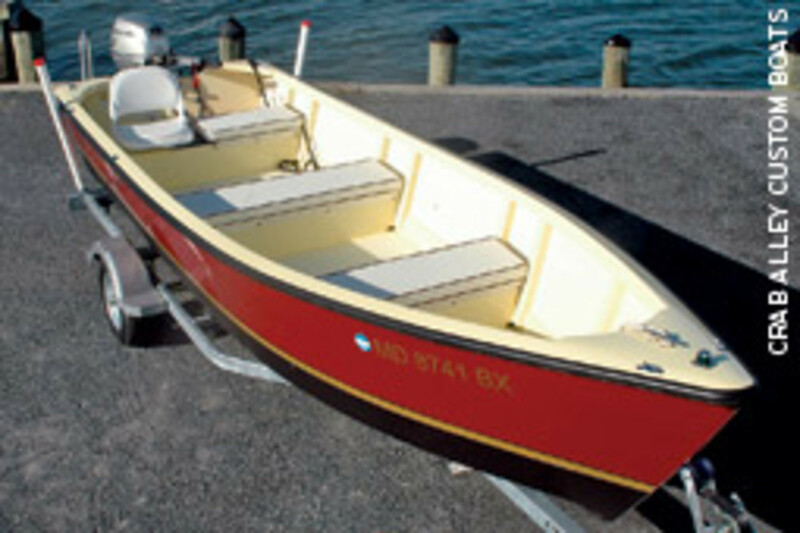 Jones’ newest design, the CA 1900 RW, began in response to Professional BoatBuilder magazine’s Design Challenge. The contest charges builders with creating a trailerable boat — less than 2,700 pounds — with maximum 25 hp that burns less than 2 gallons per hour at a 15-knot cruising speed. The winner of the Design Challenge will be announced at The International BoatBuilders’ Exhibition & Conference, which takes place in October in Miami Beach. 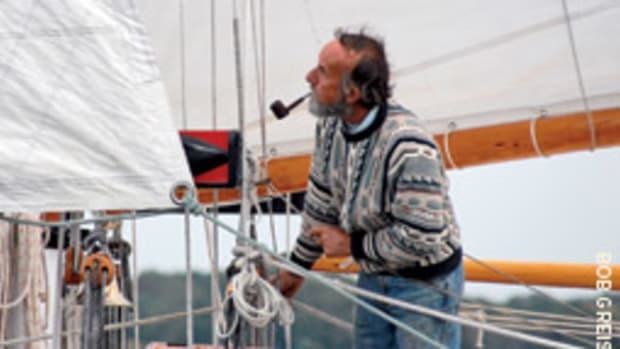 Jones, who has rebuilt wooden boats since he was a boy, says he is meticulous in the fit and finish of his skiffs. The CA 1600, with a 15-hp Honda ES-ET, custom paint and trailer, is priced at $16,990. The CA 1800, with custom paint, trailer and 20-hp Honda ES-ET, is $19,990. The CA 1900 sells for $22,990. 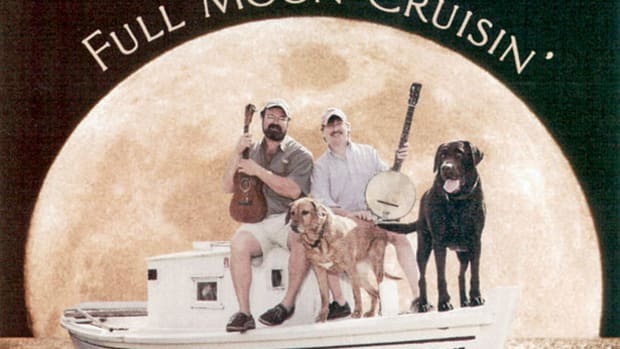 For information on Crab Alley Custom Boats, visit www.craballeycustomboats.com or call (410) 643-3452.